Dr. Suess said it best: “Oh, the places you’ll go.” There are a lot of roads out there, and as motorcyclists we are … no pun intended … driven to see them all. In our quest, TCX has us covered. 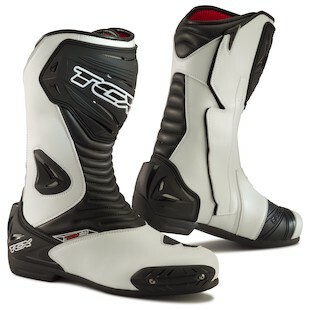 The new TCX S-Sportour EVO Boots are a completely new option from the Italian footwear maker. With a totally updated shin-plate, front slider, heel counter, and racing sole, these boots bring a lot of advancement to the table. Constructed of microfiber and with increased padding that allows for better comfort and flexibility, the outer shell encapsulates a meaty interior that all riders can appreciate. Additional improvements can be seen in the redesigned ventilation throughout the heel and a more ergonomic set up throughout the achilles that allows for greater mobility. 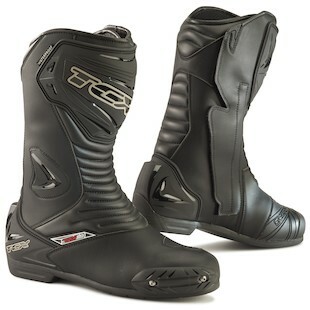 For those riders who want to get where they are going, and have every intention of getting there regardless of the forecast, all of the great features that are available in the S-Sportour EVO can be found in the TCX S-Sportour EVO WP Boots, except, as you might have guessed, the latter is waterproof! Inside of the outer microfiber shell, the WP version of this boot makes use of TCX’s proprietary waterproof lining that will keep your feet dry on those days when the weather isn’t cooperating. With so many places to go and so little time to get there, it is important that we enjoy ourselves as much as possible in between. For an entry-level sport touring boot in any conditions, check out the new TCX Sportour EVO series and go ride!